Well, I’ve done it. I’ve seen all three films in M. Night Shyamalan’s Unbreakable Trilogy (“Unbreakable”, “Split”, and this). One of the first series the TMM podcast actually did was a deep dive into M. Night’s films, and let me say that watching some of those films was rather painful (“The Last Airbender”, “Lady in the Water” were particularly bad- I know “The Happening” gets a lot of flack, but I think it’s hilarious). M. Night had, for a long time, fallen out of favor with moviegoers. 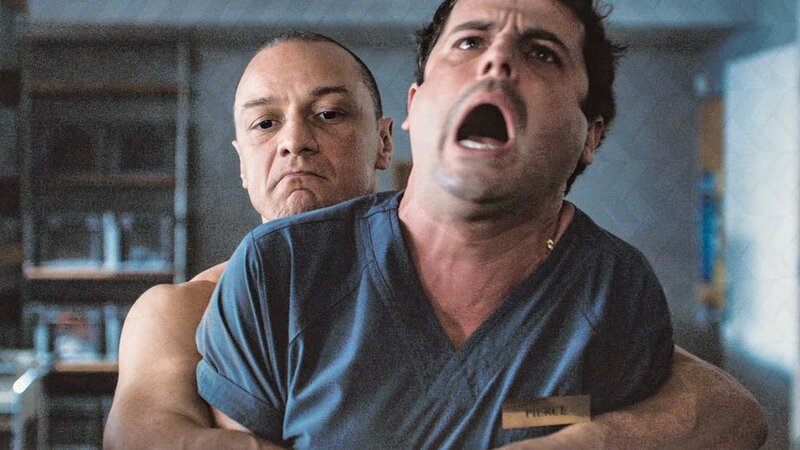 However, “Split” was a box office success, thanks in part to the uncharacteristically reserved twist, and stellar performances from Anya Taylor-Joy (“Thoroughbreds”) and James McAvoy (“X-Men: First Class”), both of whom return to reprise their roles in this film. I had hopes that “Glass” might be good. I’ll settle any doubts right away and say that this was not a good ending to the trilogy, in fact, I found myself wishing M. Night had just left the series alone after “Split”. There is honestly very little to like about this movie, so without further ado, I’ll just get right into it. After David Dunn (Bruce Willis, “The Sixth Sense”) and a man with multiple personalities whom refers to himself as the Horde (McAvoy) are captured by police and taken to a hospital, a psychiatrist named Dr. Ellie Staple (Sarah Paulson, “The Post”) tells them that they are insane and have delusions of being superheroes. Soon, the two meet another man locked inside the same hospital that Dunn remembers from his past: Elijah Price AKA Mr. Glass (Samuel L. Jackson, “Jurassic Park”). Well, not all downhill; there were some good moments. McAvoy was outstanding; though at times the writing was so cheesy that it was impossible to take him seriously. Sam Jackson was decent, as always. I felt both Sarah Paulson and Anya Taylor-Joy did fine jobs, though logically, it made no sense for Anya’s character to be involved in this story at all. Bruce Willis looked like he was just angry to be there. He never really brought any emotion to the character, nor did he do anything other than glower at the camera. After Bruce and James are taken into custody we watch them sit in hospital rooms for about an hour. There are so many pacing problems that plague the second act of this film that I honestly started falling asleep and had to crack open an energy drink. The film starts off with a bang and then immediately tries to loll you to sleep with a bunch of uninteresting psychobabble. On top of that oppressive boringness, Shyamalan starts to throw in little scenes that have absolutely nothing to do with the overall story. For example, there’s a scene where M. Night himself shows up (he usually does have a cameo) and explains that he saw David Dunn at a football arena like 20 years ago and he was in a bad place then, but now he’s in a better place. After that M. Night walks away and never comes up again… What was the point of that scene in relation to the story? To stroke a director’s unchecked hubris? M. Night’s dialogue is classic M. Night, by which I mean it is so horribly cringe-inducing I quite literally threw my hands up and shouted, “Oh, come on!” at the screen multiple times (don’t worry I was watching from the comfort of my own home, not a theater- I’m glad I didn’t pay money to see this crap). Not only is his dialogue cringe-worthy, it also is mind-numbingly repetitive. The twist at the end of this film is revealed not once, but twice in very similar infodumps, as if M. Night thought his audience couldn’t understand his juvenile twist in the first place. The worst part of this film was the ending. And here I have to throw a huge SPOILER tag up; I’m revealing M. Night’s twist, though it’s not much of a twist. So what exactly is M. Night trying to say with this rather bleak, rather depressing, but pretty stupid ending? I don’t think he even knows. 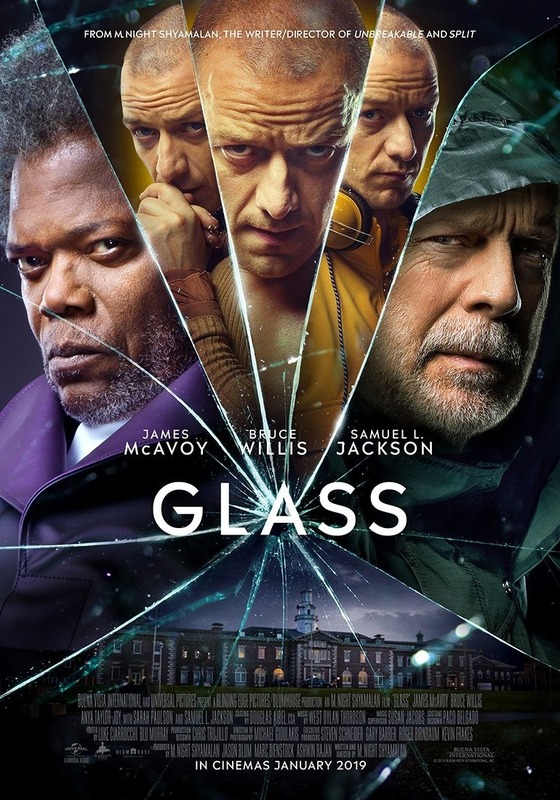 In a way, the bad guy (Glass), who, in a previous entry was responsible for hundreds of deaths, looses, because he dies; but at the same time he also broadcasts that superheroes are real, and his plan is successful. But what does that say? I really don’t know. Is it a good thing that the world knows there were three superheroes, but those three superheroes are dead now? I guess so? The themes are so murky, and the message I’m supposed to take away from this so unclear that I just shook my head. At least I made it to the end. Unfortunately, this film follows that M. Night Shyamalan pattern of bad movies. I really am rooting for the guy; I like “The Sixth Sense”, and “Signs” is decent. The problem is that M. Night needs someone else to write his dialogue… and maybe he needs to have another person come in to give him notes on his script… actually, maybe someone else should just write his scripts. Whatever he’s doing, it’s not working for him. Better luck next time, M. Night.